1. Our mono solar module adopts world-class three-gate-line solar cells which have stable performance, so it can deliver 3% positive tolerance in power. 2. The high-quality solar cells and the professional temperature control in production process ensure that our solar panels have high fill factor, thus guaranteeing high power and high efficiency. 3. The solar cells adopted have large diameters, so they can increase the power and efficiency of the solar panel. 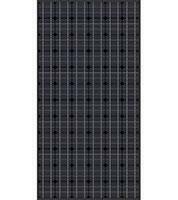 Among the 72-cell monocrystalline 125×125 series, we provide the 205W mono solar module with efficiency up to 16.06%. 4. 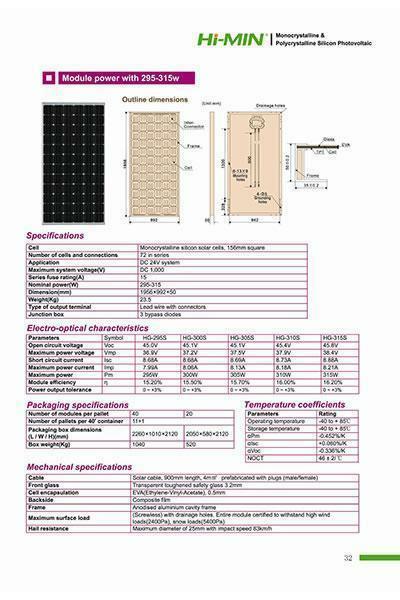 We offer PV panels with frame thickness of 35mm or 50mm. For the product with 35mm frame, more such products can be loaded into the container, which saves your transportation cost. And at the same time, such product is lighter and easier for roof installation. The product with 50mm frame is stronger and safer. 5. Each Himin product must be tested by the advanced test machines imported from Germany Olbricht Company, totally avoiding the cracks, splinter, insufficient solder, fractured gate, and other undesirable phenomena. Hence, we can provide products with no defects to the customers. 6. Our monocrystalline solar modules have passed the TUV 5400Pa mechanical load test, so they can burden snow load of 5400Pa and wind load of 2400Pa. They have also passed the TUV salt spray test, so they can be used in the area with high humidity, such as coastal areas. 7. 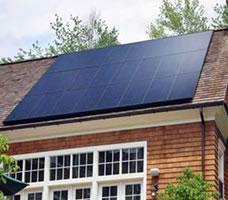 We offer 10-year warranty for our solar panels. If there is any defect in materials and workmanship under normal application, installation, using and service conditions within the warranty period, you can contact us. Then, we will repair, replace or refund. 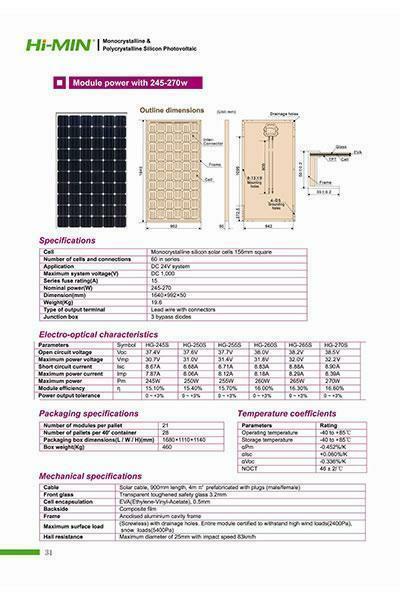 Technical data: More details about technical data are shown in PDF file. 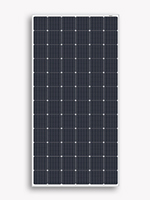 The appearance of the black solar module is very easy to blend in with the environment around the architecture, especially suitable for building photovoltaic integrated projects. It won't reflect in the sunshine and thus not affecting vision. 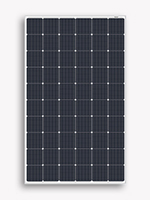 In order to meet the special requirements of customers, we have designed black solar modules to generate the greatest amount of solar electricity per solar cell. The product can capture more sunshine. With a streamlined design, it blends harmoniously into the roof of your home. This refined design allows our residential solar systems to integrate with a wide range of environments and architectural styles. And we are always working on reducing costs and increasing efficiency to give customers best support. 1. The backsheet and frame of this product are both black, so it can be perfectly combined with the roof. 2. There are two sizes of frame for your option: 35mm and 50mm. The product with the frame of 50mm appears stronger and safer while the product with the 35mm frame is lighter and easier for roof installation. For the same container, more products with 35mm frame can be loaded, and this can reduce transport costs. 3. Our solar panels are made of world famous A-class solar cells which provide stable performance, so all panels have 3% positive tolerance in power. 4. The high quality solar cells and the professional temperature control system in production process can make sure our PV panels with high fill factor, thus ensuring high power and efficiency. 5. 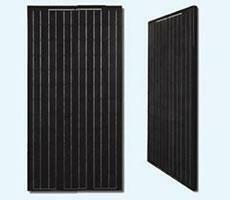 Himin black solar modules are produced by automatic production lines to avoid any possible artificial defects. 6. Each PV module must be tested by the advanced test machines imported from German Olbricht, so cracks, splinter, insufficient solder, fractured busbar, and other undesirable phenomena are totally avoided. 7. Our products have passed the TUV 5400Pa mechanical load test, so they can bear 5400Pa snow load and 2400Pa wind load. 8. The black solar modules have also passed the TUV salt mist corrosion resistance test, so they can be applied in the area with high humidity, such as coastal areas. 9. We can offer 10-year warranty for our products. If there is any defect in materials or workmanship under normal application, installation, and service conditions within 10 years, you can contact us and then we will provide repair, replacement or refund remedy. Shandong Solarway Energy Tech Co.,Ltd. Add. : Sun-Moon Mansion,Solar Valley Road,Economic Development Zone,Dezhou City,Shandong,China. Add: Sun-Moon Mansion,Solar Valley Road,Economic Development Zone,Dezhou City,Shandong,China.